Block of the Month, Mystery Quilts, and Quilt Alongs are three types of social quilting that many of us enjoy. In these activities, we gather together once a month or even once a week. There a teacher can teach us the next step in creating some masterpiece that they have prepared for us. This can happen at either your local quilt shop or online via youtube or simple blog posts. Either way, we create as a group and can therefore share our creations to receive feedback we need, or just the support we want. 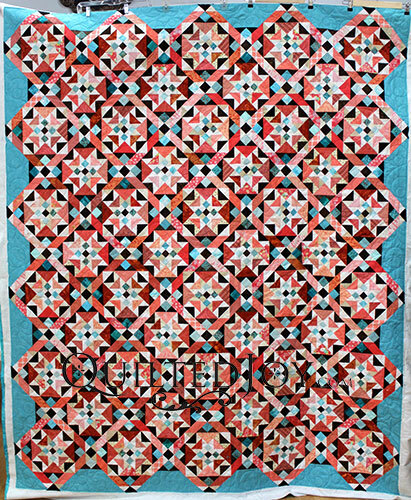 Bonnie Hunter created one of these mystery block quilts for her site, Quiltville.com, called “On Ringo Lake“. Now whether or not she made this as the mystery was unfolded, I do not know. But Pam has created this quilt, “On Ringo Lake”. I love how there are so many blocks within the blocks. It all depends on what you focus on. The colors as well are beautiful with the mixing of the cool turquoise colors and the warmer salmons and corals. It is intricate and complex and Pam has done a beautiful job of it. Pam brought this to me for quilting. With so much going on with the top, adding an additional design can be daunting. She made an excellent choice. It is called Double Bubble. This design as the name would imply, is a simple winding path with lots of large circles with smaller circles inside. All those circles would be a nightmare to do freehand or even with rulers. The Intelliquilter had no trouble with it at all. With all the turquoise in “On Ringo Lake”, we used a Glide Robin’s Egg blue to match it perfectly. You can barely see it when you are close up, and from a distance it blends right in. Quilting is a lot of fun, but quilting together can be even more fun. We are creating the Quilted Joy Clubhouse for just that purpose. You can join us as we live stream skill building ideas, and quilting designs. Share pictures of your latest creation, or just gather inspiration from others. Ask questions from us all, and answer a few yourself. Keep an eye out over the next few weeks for when we release more information about the Clubhouse! So whether you join a Mystery Quilt on your favorite blog like “On Ringo Lake”, participate in a block of the month at your favorite quilt shop, or join us at our clubhouse for an online guild experience, we can grow a lot taller together than apart.